I asked my dear friend Fishie about what type of blog posts she likes to read. She said she’d love to see some fail pics of projects. I am going to deliver on that account. I’ve bought a Simply Guava Blythe for my very first customization project. I’ve pored through the Puchi Collective Tutorials for months! I should be ready! Ha ha no. I wasn’t. I managed to get her head open no problems. I managed to get her scalp off without much issues. I did crack/chip the lip of the plastic inner scalp. I hope it’s not vital in the long run. I was grunting and sweating by the end and it’s not even the most difficult part. Armed with my precision screwdriver set, I tackled the task of removing the eye mechanism. The entire house was flooded in blue from the creative, acidic cusswords I shot off like the rounds of a machine gun. Thank goodness I did this while Natalie was asleep. I was fairly satisfied with the way the eyelids looked. Then I glossed it. It smeared but it looked like burnt lace. It still looked okay to me. Then I placed everything together and put the eye mechanism back into place. I wanted to change the eyes into sleep eyes. I did so but it still wasn’t closing right. I then realized I had to cut a cube out of a part of the eye mechanism. Cusswords ensued because I had to take the blasted thing apart again. In the frustration and process, I managed to scratch the eyelids. This means I have to repaint them OVER again. In retrospect it’s probably for the best since I can do better this time around. I also took out the eye chips I’ve painted and decided they weren’t good enough. I was totally right. I repainted them over again the the change is remarkable. I finally achieved the results I wanted! Below are the before and after pics. The left is the crappy first version. The right is the version I accomplished last night. I’m so darned pleased with the results. I’ve learned so much from this process. I also find myself enjoying it immensely. The learning curve is brutal but I love it and am planning to save for another Blythe for my birthday. I hope the weather clears up soon so I can continue with my eyelid and faceup repaints. What are the recent mistakes you’ve learned from? § 13 Responses to Mistakes! They do happen! Adventures in Blythe Customization"
You dont cut anything out for sleep eyes; just remove the spring and replace it with another pull string. You can cut pieces out to boggle (which gives a wild-eyed look because the lid is COMPLETELY open but current dolls don’t really need it. Thanks!!! I’ll do that! I’m thinking of replacing the strings with ribbons. Hope they help in any way. p.s. Your painted chips are brilliant! Chris, I’m Hyonsuk. I went into the webiste link you’ve suggested for sleepy eyes and it is no longer available. I am working on my 1st blythe too. The eye mechanism was working but now after I’be taken it a part and put it back together, it doesn’t work anymore. 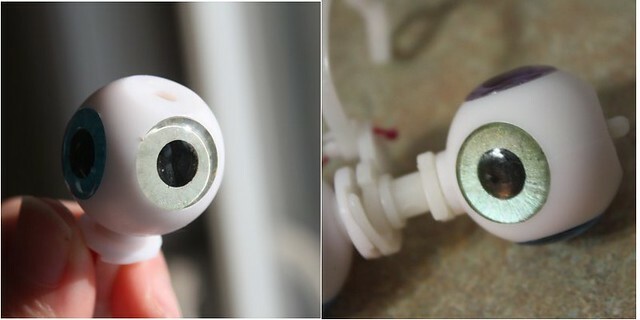 The U-shaped part that goes to the eye mechanism seem like it is angled too high compared to what I see in some others in youtube site. I can manually push the U-shaped part and change the eyes but pulling string won’t do unless I pull it up towards her forehead instead of the back ward direction. I hope i made sense explaining the situation. anyways, would you know a site or a blog where I can get some help? It can’t be hard. I want to learn it myself. thank you. Thanks Sam! I find the Melbourne tutorials to be more helpful to me actually. I think it’s because of the video format. I want to see your custom girl!!! Hi! Hahah, I was glad reading your text, because I had the same problem with removing the eye mechanism when I customized my first Blythe, and I totally agree that we learn from the mistakes. I actually think we learn much more from them than when we are correct. I also loved how your hand painted eye chips turned out. The second version is amazing. Would you mind telling me how you did it? What kind of paint did you use to make it shine and shimmer according to the light? And did you paint it directly onto the transparent chips (and are they flat, or do they have the pupil ‘part’? ), or did you paint them in a paper and attached? First of all the lip carving you did for your blythes are stunning! Great job! 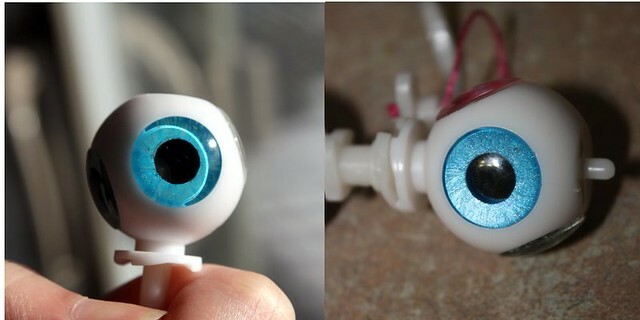 As for the eyechips, I got the ones with the pupil already on it. I painted the back of the pupils with black acrylics. I painted directly on the irises with sparkly acrylic paint. It took a long time to figure out how much paint to use and how to paint them. 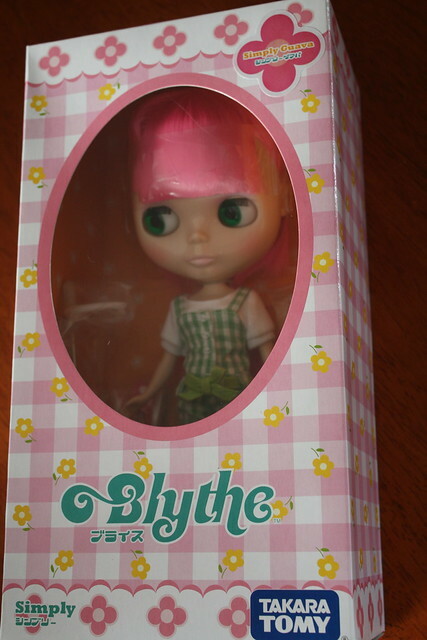 I want to customize my blythe doll and am interested in painting new eye chips for her. I haven’t been able to find any info on what type of paint to use. So I’m asking for your recommendation on paint type. Thanks! 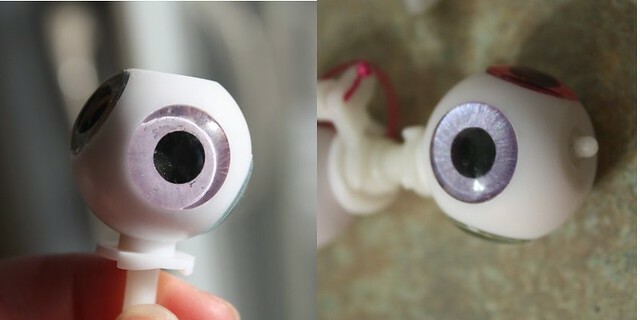 When you remove the eyelashes on MANY Blythe models (even variances occur WITHIN a particular release), whether they be official release dolls, factory girls, or clones, you may notice that removing the spring for sleep eyes is NOT enough! The lids don’t look completely closed! Pretty much the ONLY fix for that IS to cut away a box shape out of the eyelid portion of the mech. You can sand parts until the cows come home, and those lids don’t drop…. Oh yeah, and when BOGGLING the eyes, the only thing you need to trim back is the T bar….not the mech! I have done tons of customs, and learned that EACH doll presents her own issues that require creative, on the spot thinking. You are currently reading Mistakes! They do happen! Adventures in Blythe Customization at Sushi Candy.